Already listed with our Phuket swimming pool and spas directory? 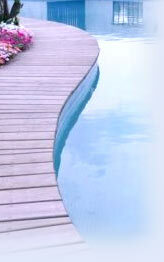 Quality swimming pools and spas are located all over Phuket. Different sizes, brands, shapes are offered to every customer. Buying swimming pool and spa in Phuket is easy found by visit our Phuket swimming pools and spas. We have a comprehensive information of swimming pools and spas for you. Ounjai Pattana Sales & Service General Partnership distributes and installs pumps, filters for households, hotels as well as all types of industries. Paradise Pool is a prominent leading provider of high quality swimming pool, spa and Jacuzzi designs, equipment, pool consultancy and services in Phuket. Phuket Pools with our professional pool building team who can create for your specification for beauty, safety and design, premium quality, proven reliability, exceptional customer support and exacting craftsmanship. Phuket Swimming Pool Equipment Co., Ltd.
Phuket Swimming Pool Equipment Co., Ltd. gives the high quality services with over 25 years experience in swimming pool design and swimming pool system installation by our professional team. Spas-R-Us has grown to become the largest and most comprehensive trade and retailer of indoor and outdoor spa-jacuzzi's and hot tubs in Phuket.